Yesterday, I made a strategic decision to take an afternoon off from my work and my business, despite there being a lot that needed to be done. 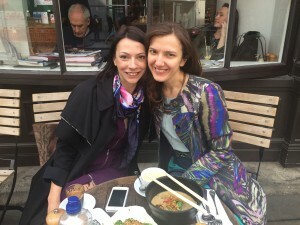 I spent the afternoon with one of my best and oldest friends, who is visiting London this week. This gorgeous woman has known me since I was 8. To say that we have been through a lot would be an understatement. As we sat in a stylish cafe in London’s Marylebone, enjoying good food, delicious desserts and people watching, we were just being ourselves. It was so easy, natural, effortless and yet so profound. Anyone who knows me, knows how important my friendships are to me. However, my relationships with my girlfriends have not always been this effortless. Being out with my friend reminded me of how I felt several years ago and how much has changed in my life and relationships. What is the biggest change I have experienced in my relationships with other women? Competitiveness among women is not a very popular subject these days. It is not the most comfortable subject for me to talk about either. We are being told that women are collaborative beings by nature and that when we compete we are in our masculine energy. I agree, it feels a lot better when women feel safe and secure with each other and are open to collaboration. But sometimes you just can’t help it but feel competitive around other women. I know many women feel this way. I know women who tell me they still find themselves judging other women, no matter how hard they try not to. I know this is a big issue in make workplaces. I have even been told by some women in private that it is the women in their companies, not men, who don’t want other women to progress in their career. Of course, it is clear that this attitude and behaviour is caused by a fear of lack, i.e. if she get this (job/man/promotion/client), then there is less for me. But when you are in it, it is very difficult to focus on abundance as a way of “pulling yourself out of it”. When you are in it, if you are like me or most other women I know, you don’t want to feel that way, you are uncomfortable, and you may even judge yourself for feeling that way. It is true that when women get very competitive with each other, it can get very ugly. I remember when I was feeling other women were in some way a competition to me. It wasn’t always that we were actually competing for something. It was just a feeling of inferiority or superiority: she is more beautiful, I am more successful, she is better dressed, I have better lifestyle. This competitive energy may show up in the form of judgment for you, for example, being triggered by a woman who looks stunning or judging a woman who does not work and is receiving from her (wealthy) husband. We often push it away because it is uncomfortable. Sometimes we may try to justify the judgement. But deep down we know this comes from feeling insecurity as a woman on some level. My afternoon with my close friend reminded me of times when I was feeling inferior or superior, when the way I was showing up was partially motivated by a desire to not be second best. So in other words, I was reminded of the times when I unconsciously felt I had to compete. One thing I now know for sure, there was no power in this feeling, not even when I felt superior. One thing that enabled me to shift (quite effortlessly) this unpleasant competitive energy was recognising my own uniqueness and fabulousness. This one change transformed all of my relationships with other women and men too. To be able to write “my fabulousness” is a huge shift in itself. When I began to show up in the world as real me, as the woman that I know I am with all my quirks, when I stopped hiding my edge, I automatically enhanced my relationships. I know it sounds simple, but it really works. When I show up as my best self, when I feel fabulous because I look the way that to me is fabulous, when I take care of myself, when I show up just for me and everything else is a bonus, my interactions with other people are magical. From this place I am able to effortlessly appreciate the fabulousness and uniqueness of other women. My relationships and connections have gained a new level of authenticity and depth. Competition is no longer an issue, it just isn’t. And best of all, I feel truly in my power. Today, I invite you to look at your relationships with women in your life: your girlfriends, colleagues, sisters, clients, acquaintances. How do you show up in these relationships? Do you want to be “better” than them in any area? Do you judge them for anything? Do you feel any jealousy if you are completely honest? If you discover that you do experience any of these feelings, I suggest you stop resisting them. It does not do anything. Instead, look at how you could enhance the way you show up as a woman. What would happen if you allowed yourself to feel beautiful today, to look your best – just for you, not to impress others, to wear what makes you feel elegant and gorgeous, to take time for yourself? I would love to hear what changes you experience in your life as a result of owning your beauty and uniqueness. If you know that this is the area of your life you are ready to transform today, I would love to have a conversation with you. I have created a special Private Day for women who are ready to unlock the power of their beauty, style and femininity and show up effortlessly and powerfully in all areas of their lives. If you are one of these women, I invite you to schedule a conversation with me to discover whether this is for you. Click here to schedule a complimentary call with me today. The spaces are limited.